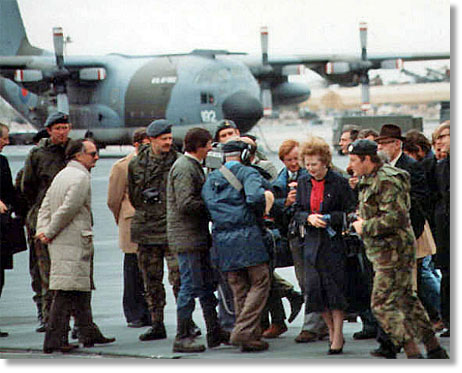 Newly-released Government memos reveal that Margaret Thatcher flew from Brize Norton to the Falklands Islands at a cost of more than £200,000 in 1983. The then Prime Minister visited the islands for four days that January to mark the 150th anniversary of the establishment of a permanent British settlement. It came eight months after the end of the conflict. The documents, released ealier this month by the National Archives, include briefings from the Ministry of Defence marked “Secret UK Eyes A” about travel arrangements. The PM was flown by the RAF to Ascension Island before being taken on a Hercules transport plane to Port Stanley, the islands' capital. The flights cost £209,867, an invoice shows. Anyhow, he showed us a catalogue of all the weapons and gadgets availble: the pencil bomb, the tyre buster hidden in horse excrement (where drivers would just run over it only to ignite an explosive device). The best was the plastic rat that was filled with plastic explosive and some bod would just shovel it into a boiler or similar and it would of course destroy it. All these and many more devices that would harrass the Germans and keep them on their guard. The catalogue was printed in the early 40's so goodnes what would have happened if the Germans had got a copy of it! The two main aircraft that were used to get the agents into the occupied zones were the Lysander and the Hudson, and they ferried hundreds of agents into and out of Europe. The SOE also operated in Africa and the Far East and he told us that they were instrumental in turning the French into being our allies in Madagascar after ousting the Vichy government there. He told us that about 9,000 people were agents of which one-third perished at the hands of the Germans. p.s. Just a bit of info on the Cosford Branch. We are very active and over the next couple of months trips have been organised to RAF Brize Norton, Scampton, Conningsby, East Kirby and Waddington. Then in October a visit to the RAF's reseve collection at the former 16 Maintenance Unit at Stafford. We hope to have trips to RAF Valley and Bletchly Park. Have a look at our website. The Honourable Kerry-Lynne D. Findlay, Q.C., Associate Minister of National Defence responsible for military procurement and the Honourable Peter MacKay, Minister of National Defence, today [June 27] welcomed the delivery of the Canadian Armed Forces’ first new CH-147F Chinook helicopter at a ceremony at the Canada Reception Centre. I am organising a collection for Help for Heroes at Tesco in Emery Gate, Chippenham on 14th and 15th September. It would be really great if a few people could come and give me a hand! If you can help, either e-mail me or register with H4H. Could you pass this to any members who may be available. If you can't spare the time, it would still be good if you could drop by and say hi! 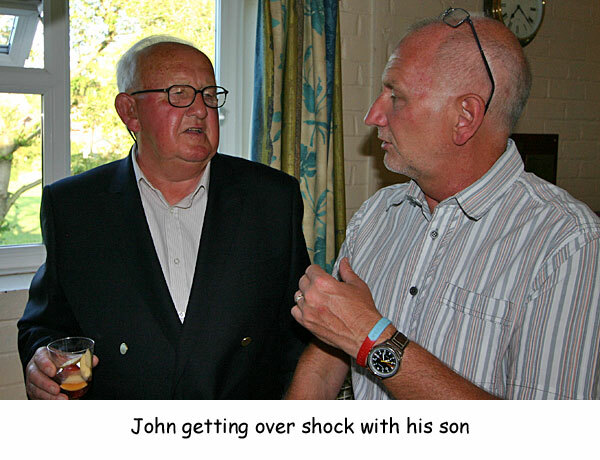 Please find attached a few pics from John Middleton's surprise party. It was a good do and John did not know what was going on until he was about ten feet from the entrance to the party venue! Once again you, along with your website, have excelled yourself. I understand you also knew about my surprise party. Your e-mail made me smile when I read it, especially with the amount of people you sent Sue's request to! If I had of been in her shoes I would have panicked. Needless to say I was well and truly 'stitched up'. 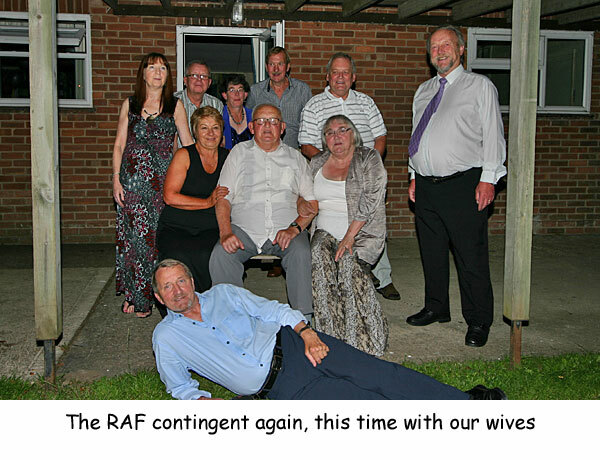 However, the party was fabulous with a very good RAF turnout. 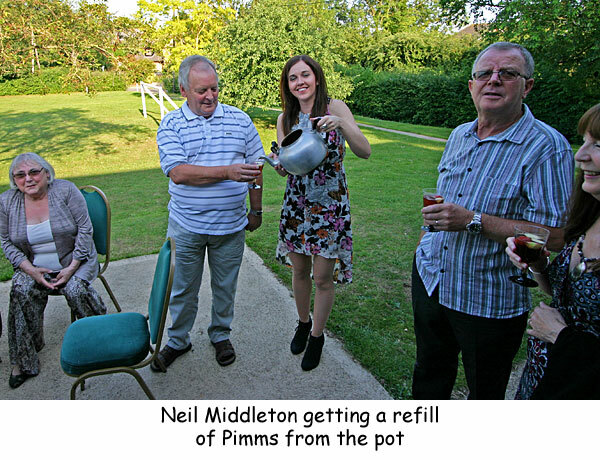 I wondered if you could make a simple post on your website thanking those who sent me cards, e-mails, gifts and also a special thank you to those who came on the day. Our monthly get together and as usual a very good turn-out (after all we do meet in a pub!). 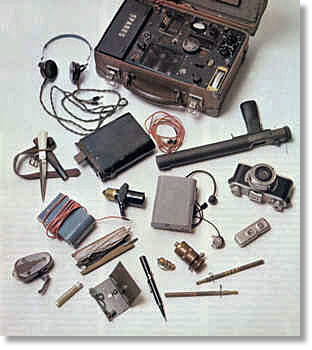 This time the talk was about the Special Operations Executive (SOE) in WWII, and called "Gadgets Galore". This was to be all about the various bombs, guns and aircraft used to ferry the agents to and from German occupied territories. 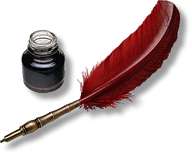 who was, at the time, in the government cabinent and had the task of creating the charter by which the SOE would operate. People who became agents had a 50/50 survival rate. Two notable operations they were invoved in were destroying a vital railway bridge in Greece and of course the Norwegian members who blew up the heavy water plant (Heroes of Telemark). Where are the world's major military bases? 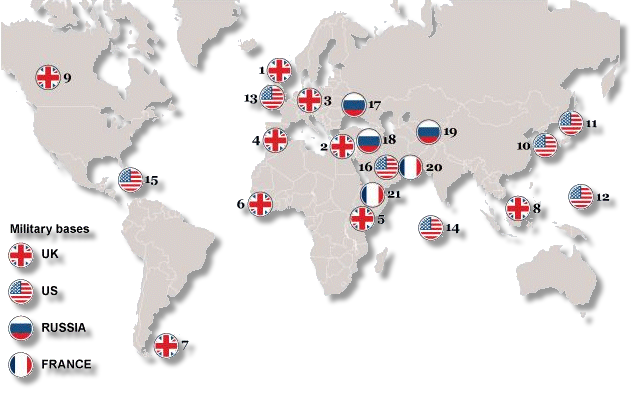 As the British government examines whether it could maintain Trident's base in an independent Scotland, here is a look at some of the major military bases on foreign soil - excluding Afghanistan - around the world. 1) Scotland - The Faslane base, on Gare Loch, is home to the UK's Trident nuclear submarine base. 2) Cyprus - Two bases, at Akrotiri and Dhekelia, were retained as British sovereign territory with independence in 1960. 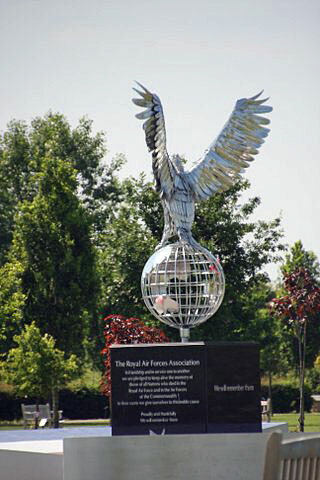 The bases are home to army, navy and RAF personnel. 3) Germany - British forces will have all left Germany by 2020. However, there remains a significant presence, with the Rhine Garrison as the headquarters. The US also has 48,000 soldiers in Germany. 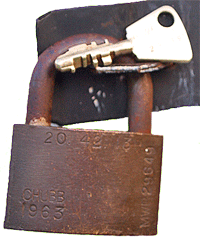 Peter Clayton and I have something in common - padlocks and cycling! The picture is from my tool work chest provided for Category 3 repair of all RAF aircraft north of a line drawn from Aberystwyth and the Wash. I had just passed out from Halton as a substantive corporal aged 20 years of age so you can imagine the ribbing I had in the corporals canteen! - that's another story! Along with Pete I am a veteran cyclist with 100 miles per day not a problem - so keep at it Pete. As to how I am still in possession of such a lock I can't remember other than when I left for commissioning they must have presented me with the trophy which now secures my garden tool shed! home to the Royal Gibraltar Regiment, and acts as a Joint Operating Base for UK operations in the region. troops coming in to train. Britain also has a peace support team in Kenya, working on security sector reform and mine removal. 6) Sierra Leone - Established in 2002 at the end of the civil war, Britain has a military advisory and training centre on the outskirts of Freetown. 7) Falklands - A combined force of army, navy and RAF is based on the islands. 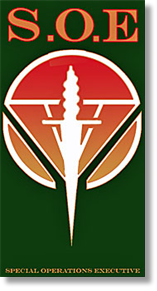 8) Brunei - An infantry battalion and a Bell 212 helicopter flight are based in Brunei, which is used as a centre for jungle warfare training. 1,000 tanks and armoured vehicles are kept there to train 7,000 troops each year. south of the capital, later this year. 11) Japan - Okinawa is home to about half of America's 50,000 troops stationed in Japan. 12) Guam - Andersen Air Force base is home to bomber crews, while nuclear submarines are also housed here. handles 30 percent of all US military traffic within Europe. 1973 to make way for the American base. It is now uninhabited, except for military personnel. retains sovereignty. It is home to the Guantánamo Bay detention camp, opened in 2002 to hold prisoners from the "War on Terror". the Fifth Fleet), Kuwait, Oman, UAE and Yemen. Overall in the Arabian Gulf region there are reportedly 40,000 American servicemen. 17) Ukraine - Sevastopol is home to Russia's Black Sea Fleet - the largest subunit of the navy. forced to deny that it was withdrawing its personnel from the base, and emphasise that the centre was staffed by civilians, not military staff. Russia and Tajikistan ends in 2014, but a new agreement has been signed which remains in force until 2042.
and its first centre in a country which was not a colony. 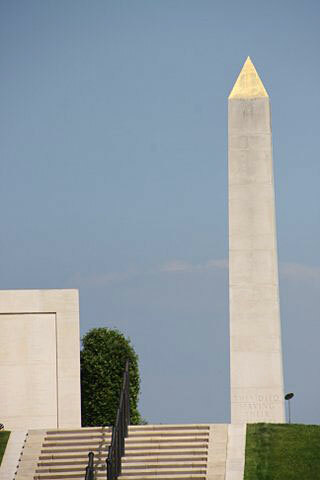 It is home to 500 troops. 21) Djibouti - Home to France's largest base in Africa, plus a major US base. 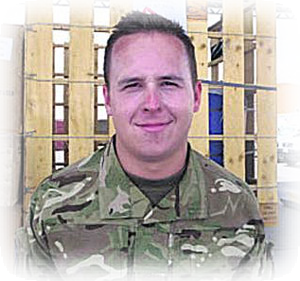 Senior Aircraftman Neil Robinson, 25, of 1 AMW, was part of the team that loaded Prime Minister and Witney MP David Cameron on to a plane during his recent trip to Afghanistan. SAC Robinson, originally from Swindon, said: “The hardest bit is the tiredness. You are constantly working 12-hour shifts and you don’t really get a lot of time to think about home, you just get on with the job. Not all RAF Brize Norton personnel are based at Kandahar. Men and women from 1 Air Mobility Wing (AMW), part of the Theatre Logistic Group, work as movers and are based at Camp Bastion, the main British base in Helmand province. They unload planes and helicopters when they land at Bastion - sometimes in as little as 45 minutes - before packing them up again with the next shipment. Between flights, they work to build and pack pallets with equipment. SAC Sutton, from Maesteg, South Wales, was convinced to join the RAF by a friend who was in the air force. She said: “I like the physical part of the job, I couldn’t be stuck in an office all the time. I’ve surprised myself, because I thought I’d be homesick. Her dream is to eventually join the police and help to “put naughty kids on the straight and narrow”. Another one of the U.K. Royal Air Force’s fleet of Vickers VC10 air-to-air refueling tankers ended its operational service. The retirement of aircraft XR808 also known to crews as “Bob” on July 29 leaves just three of the elegant British-built airliners left in service. The flight was also significant as it heralded the last flight of an original Type 1101 VC10. The remaining three RAF VC10s are conversions of the Standard and Super VC10 variants. The fleet, due to retire this September will mark the end of a long era for the RAF which has been flying the aircraft since late 1966. The aircraft will be replaced by the fleet of Airtanker-operated Airbus A330 Voyager multi-role tanker transports which are currently being delivered. While the A330 is significantly more capable than their 1960s predecessor, it is fair to say that the modern Airbus doesn’t quite have the presence of the VC10. The Vickers design has always been more than capable of making its presence felt with the scream of its four Rolls-Royce Conway engines and an inevitable trail of black smoke on landing and departure. With an impressive 43,865 hours on the clock, XR808 was flown from its home at RAF Brize Norton where it served with 101 Sqn and was taken to the former USAF bomber base at Bruntingthorpe, Leicestershire. It had been earmarked for preservation at the RAF Museum in Cosford, but now its future is less clear. The VC10 made its last public airshow appearance at the Royal International Air Tattoo at RAF Fairford on 20-21 July, but a retirement ceremony is planned at RAF Brize Norton, home of the VC10 fleet, during September.The RAF has flown 28 VC10s in several different configurations. Once all the VC10s have gone, 101 Sqn will become the second squadron to form on the Voyager. Squadron Leader Bill Jacobs, affectionately known amongst the lads in Abingdon as "Jack Hobbs," was the first commanding officer of UKMAMS. 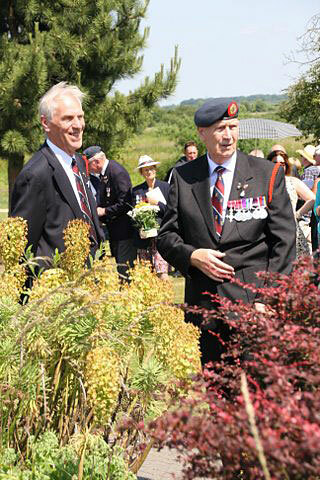 Back on Sunday the 7th July, two friends and I ventured north from this ancient city of Bristol to near the centre of this great country of ours, to visit the National Memorial Arboretum. 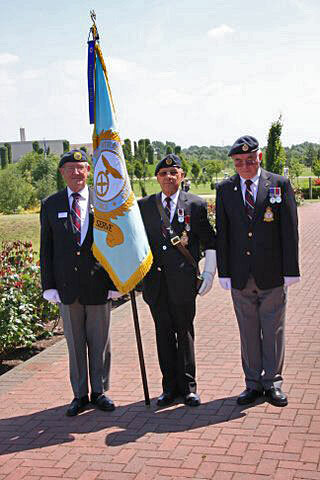 This was for the RAF Boy Entrants memorial service and wreath laying. None of us had this pleasure before and did not know what to expect from this 210 mile journey. The whole day could not have been any more pleasant. 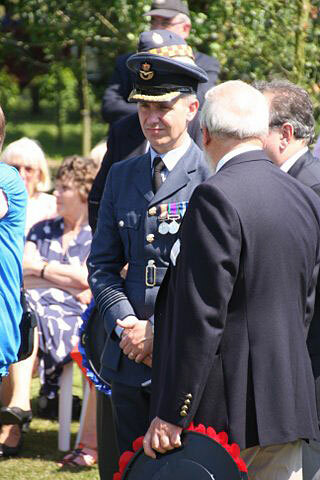 The remembrance service, the weather, the atmosphere and meeting several of the "Old Boys" that I have got to know over the years has been etched within the remaining brain cell of mine forever more. I really enjoyed the whole day out. Although, I might add there was not enough time to see all that there was to offer at this wonderful place. There is still an awful lot more work to carry out, but let it be said that what has been completed, is "Top Notch" and well worth the visit. The time there flew by, what with all my gassing and shaking of many hands and it was only £3 for entry and to park all day. If I ever get to go there again I shall have to make arrangements to stay over at a nearby hostelry, so as to take it all in. 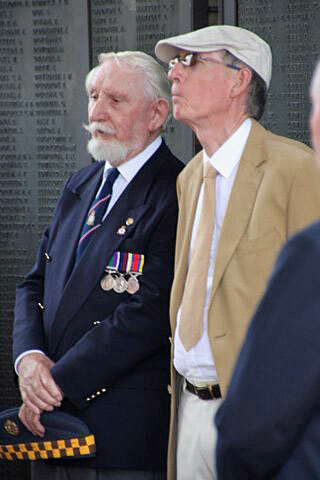 The two buddies that accompanied me were my best mate "Tiny" from the 30th Entry St Athans (he was airframes, but I have forgiven him! ), together with an ex-sgt copper pal. As I mentioned, it was a double pleasure for me to eventually meet some of the guys of the "Hereford Bullocks" that I have corresponded with for quite a while. Putting faces to names and the general chit-chat which ensued I found to be exhilarating and well worth the trip. 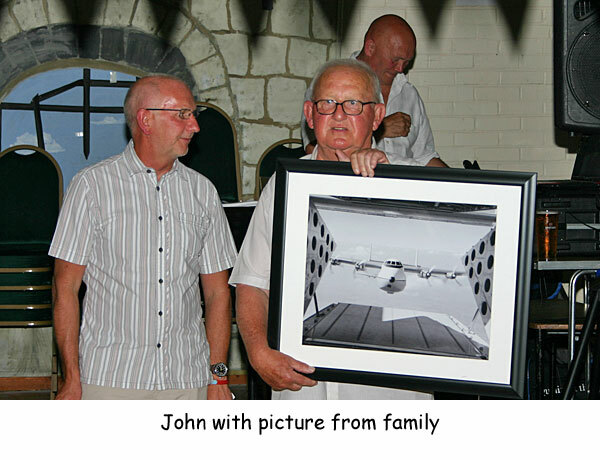 I have also emailed, to thank, some of the guys that I had the pleasure to meet, together with Cannon Tony Porter, (9th Entry, our personal Padre) who as one of us shared our common RAF service life. 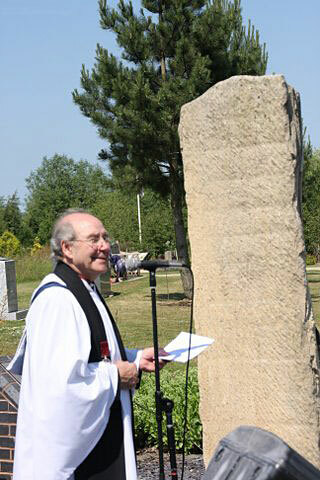 He always gives out a feeling of togetherness and provides that final touch with his prayers and selection of hymns. Finally, the unscheduled stop for something to eat at a roadside 'Ale House' became another event that topped off the day and unexpectedly gave me the opportunity to once again say my farewells to a group of ex Boy Entrants with whom I was proud to have served my country. 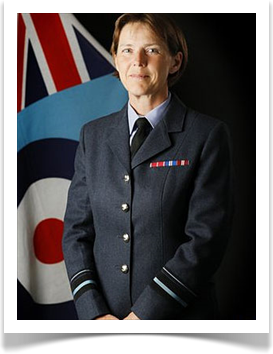 The RAF has promoted a female officer to the most senior position ever to be held by a woman in the UK armed forces. The air force has appointed its first female two-star officer, Air Vice Marshal Elaine West, the Ministry of Defence has announced. AVM West, 51, joined the RAF straight from school and is married with a teenage son. 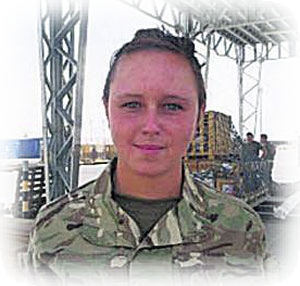 Defence Secretary Philip Hammond said it showed there was no "glass ceiling" for female officers. The position is equivalent in rank to a major general in the Army or a rear admiral in the Navy. The new air vice marshal will be director of projects and programme delivery at the Defence Infrastructure Organisation. She will lead on multi-million pound infrastructure projects to support military training, and oversee the drawdown of army units from Germany. 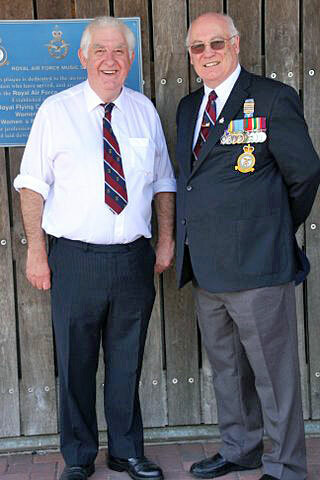 This might be of interest to all those who served at Lyneham. Please sign the petition if you feel strongly about it. 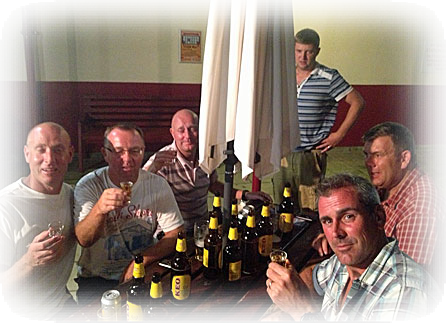 Akrotiri raising a glass to Oz Oswald, "One for the road mate!" with Mark Taff Gibbons, Dean Richardson, Chris Hall, Andrew Holloway and Kevin Skinner. 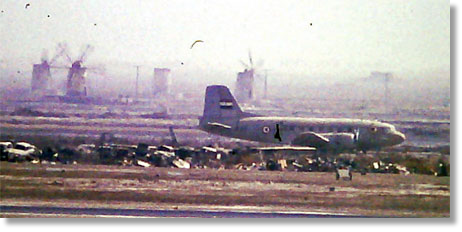 RAF Mystery photo; It could be the Yemen Air Force, IL-14, flown by Egyptian crew, landed by mistake at Lodar, early 1964. On dump at RAF Khormaksar, 1964-66 - never did manage to get over there to photo it! Memory is a funny thing - I do not recall the windmills, so it may not be K’sar. [Located on the road from Khormaksar to Sheikh Othman and Little Aden, the salt works were a landmark that date back to the late eighteen hundreds. 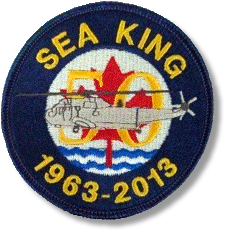 The moment of sheer terror is one story air crew and maintenance workers shared recently in Halifax as they gathered to recall the 50-year history of Canada's Sea King helicopters. A series of events took place for three days, including a tribute at the Grand Parade. 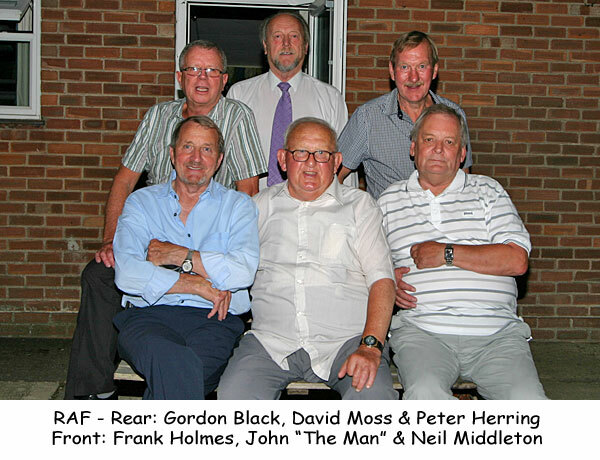 But as they marked the golden anniversary, tales of survival are mixed with questions over how much longer the helicopters should be allowed to fly. Aaron Plamondon, an historian at Mount Royal University in Calgary, says the anniversary is a date that should concern Canadians because there is no replacement ready to take over for the aging aircraft. 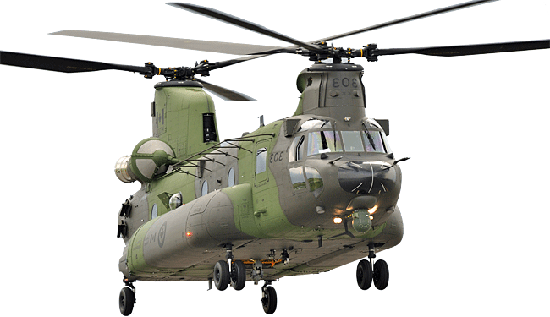 Eleven years later, Ottawa signed contracts worth $5 billion with Sikorsky to build 28 H-92 Cyclone helicopters. They were originally due to start relieving the Sea Kings in 2008 but they have experienced a series of delays and cost overruns. 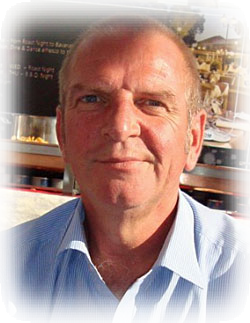 Former Sea King pilot John Orr - the author of "Perseverance: The Canadian Sea King Story" - prefers to focus on its ability to adapt from its original job as a Cold War submarine hunter to tasks such as hauling supplies over the deserts of Somalia, monitoring surface vessels in the First Gulf War and chasing drug runners off the coast. "It's not a sports car," he said. "It's a truck, but it's reliable like a truck and it's very utilitarian like a truck. What constantly amazes me is how the people - the technicians and the air crew - have been able to keep this thing going and doing a good job." 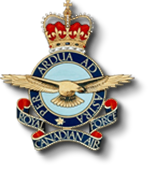 The helicopter purchase was announced in the fall of 1962, and the first aircraft - Sea Kings 4001 and 4002 - flew to Canadian Forces Base Shearwater on the outskirts of Halifax on Aug. 1, 1963. Gordon Gray, one of the first pilots, said he was awed by their capabilities. Sitting in the Shearwater Aviation Museum before its predecessor, the Sikorsky "Horse" S-55- he holds a photo of himself in the light fatigues of the time, standing before the new Sea King. "We were going from flying a Model T to driving a modern Cadillac," said Gray, 75. He recalled how the Canadian military used the Sea Kings aboard destroyers and the aircraft carrier HMCS Bonaventure during exercises in the North Atlantic, training to play cat and mouse with Russian subs. 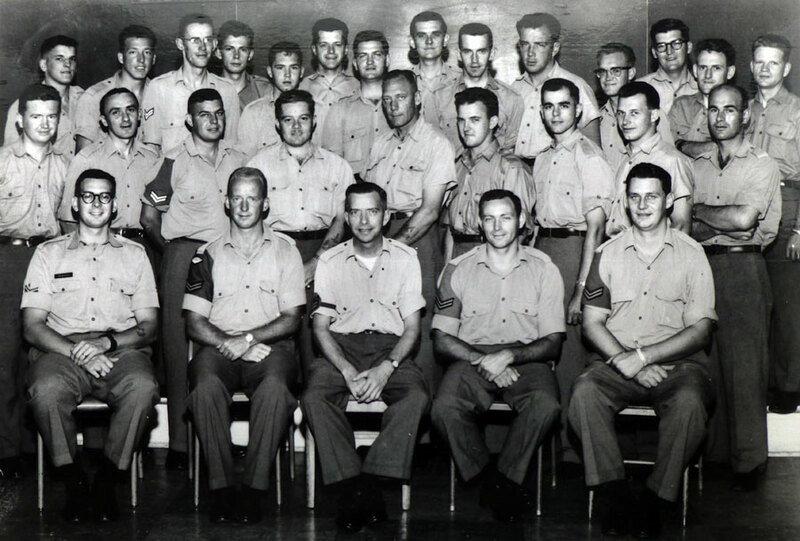 Jim Clarke was a 22-year-old captain on Feb. 7, 1969, when he experienced the helicopter's ability to survive. 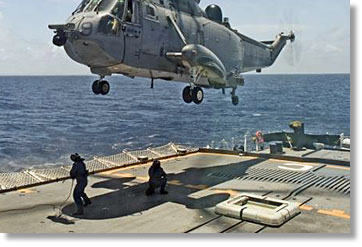 After lifting off at night from HMCS Bonaventure, the helicopter was sucked up by a waterspout, a gyrating column of water formed by a whirlwind above the sea. It twirled around like a top, rising about 420 metres in less than a minute before being spit out from the top of the funnel. "The four of us got back to the carrier fine. The aircraft was shut down, checked over by maintenance and went flying the next day," he recalls with a smile. "You'd take off in a perfectly serviceable mission and then something breaks on you or fails on you, and you have to abort the mission," McWha said. The irony, he adds, is that today the aircraft are more reliable, as technicians have dealt with almost every conceivable problem through the decades. When the aviators and maintenance technicians gathered, there were sombre moments, as they recalled crashes or mishaps that took 10 lives over the years. McWha struggled to keep his composure as he recalled a fiery 1994 crash into a hillside near Saint John, N.B. "I had to take a call from the pilot's mother who had heard the news on the radio in Peterborough, Ont., and I confirmed to her that her son had perished," he said. 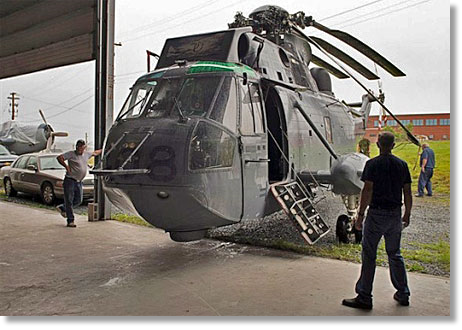 A fuel line had frayed and leaked, feeding a fire roaring on the helicopter. The original fleet of 41 has dropped to 25 aircraft today, some of which are also stationed in Patricia Bay, B.C. 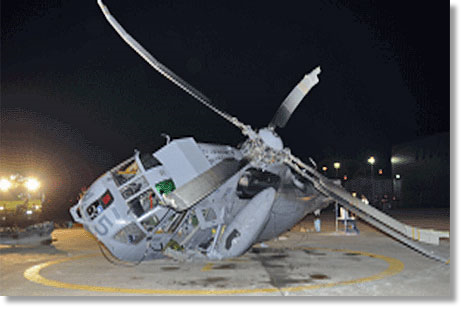 Just a few weeks ago, one of the Sea Kings tipped over and smashed its rotor blades on the tarmac of CFB Shearwater, sending pieces flying into nearby buildings. "We went from crisis to crisis to crisis," he said. "The Sea Kings are put on navy ships which are pointed out and away they go out. They're always the first ones there. In that sense, there is a great sense of accomplishment." Or speaker today was Squadron Leader (Retired) Richard Painter. It was his second visit to us and this time the subject of his talk was on notable bombing missions (his previous talk being on unmanned aircraft against insurgents in Afghanistan). His talk covered both strategic and tactical bombing commencing with WW1 and the Zepplin airships; the first being in June 1915 on London and as far up as Walsall. The first building to be hit was a pub, the Neville Arms in London, then the raids on Great Yarmouth and the East Coast. Later on with the first bombers to be used in war, the Gotha (pictured at left). Both the Zepplin and the Gotha were used on civilian targets and not military ones. He then gave us a description of the indiscriminent bombing of cities in WW2 which, in his opinion, was inefective as it really made us more determined to fight on. Civilians killed in Great Britain were over sixty thousand, while in Germany there were in excess of four hundred thousand. One fact that surprised us was the Allied bombing of the French cities on and after the D-Day invasion which killed over sixty thousand civilians. He described the 1967 Israeli bombing of Egyptian targets, which was most effective in almost destroying the entire Egyptian air force. His talk continued with his decription of the bombings in Korea, Viet Nam, Iraq and Libya. The Black Buck raids by the Vulcans (pictured at right) on the Falklands made a few holes in the airstrip but didn't stop them using it and their Super Etands kept on the mainland out of harms way but they still used them with great effect on our ships. All in all I think he gave most of us fresh thoughts on the subject. 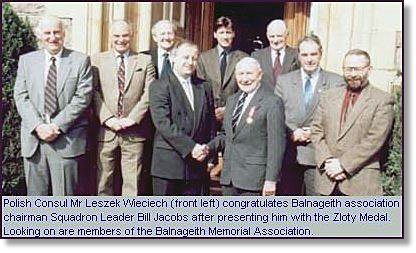 He took nothing away from our lads of Bomber Comand who carried out what they were told to do, but at what cost? 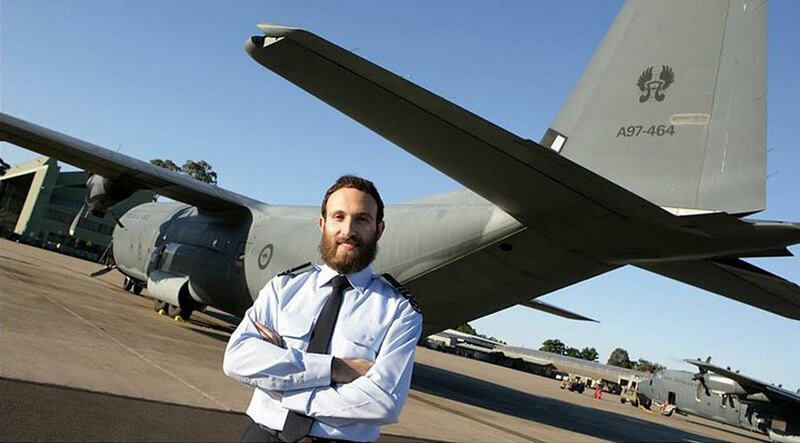 The Chiefs of the Air Forces of Australia, New Zealand and the UK took the opportunity to fly in the Airbus Military A400M at the recent Royal International Air Tattoo airshow at Fairford in the UK. 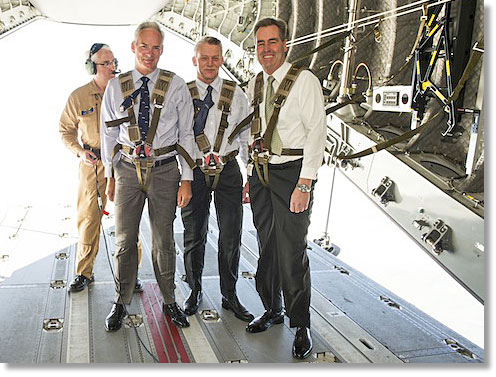 The photo shows, left to right: ACM Sir Andrew Pulford, Royal Air Force; AVM Peter Stockwell, RNZAF; and AM Geoff Brown, RAAF; standing on the open ramp during the flight accompanied by an Airbus Military loadmaster. Can anyone guess this place? THE third home to be relocated from the RAAF base in the Darwin suburb of Eaton was removed on the back of a truck. 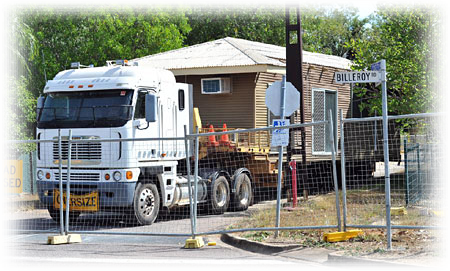 Northern Transportables project manager Scott McMillan said yesterday it was the final house to be moved under the watchful eye of NT Police. "We started moving on Sunday as per our traffic management plan,'' he said. The rest of the 277 homes will be taken down the Stuart Highway to a holding yard in Berrimah over the next three years. Mr McMillan said the company had been working on the base for the past 10 weeks doing small demolitions to get the houses ready for relocation. He said there had been plenty of interest from people wanting to buy the homes. "A lot of interest we've had is from Territorians looking at developing a block or putting a house on a rural block,'' he said. 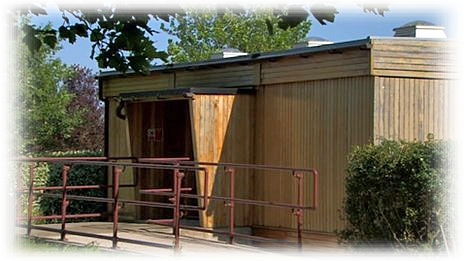 "Most of the time they are all elevated homes with living areas upstairs. Mr McMillan said there would be about four or five moves per week but it would not happen during peak traffic times.